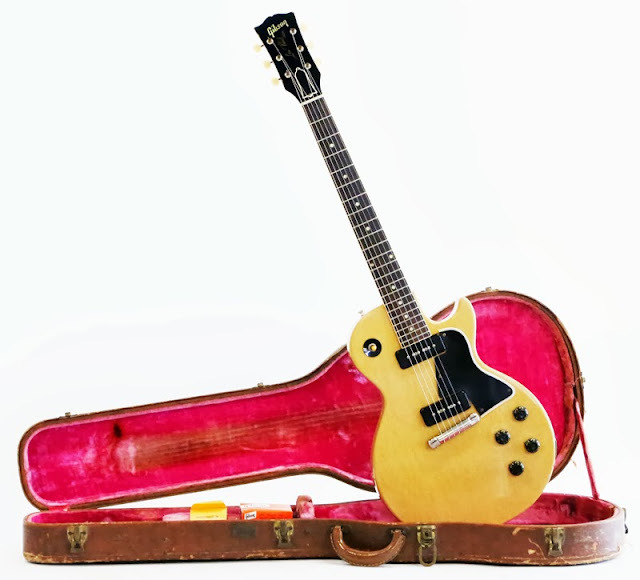 "For sale is this vintage 1956 Gibson Les Paul Special electric guitar in TV Yellow finish. 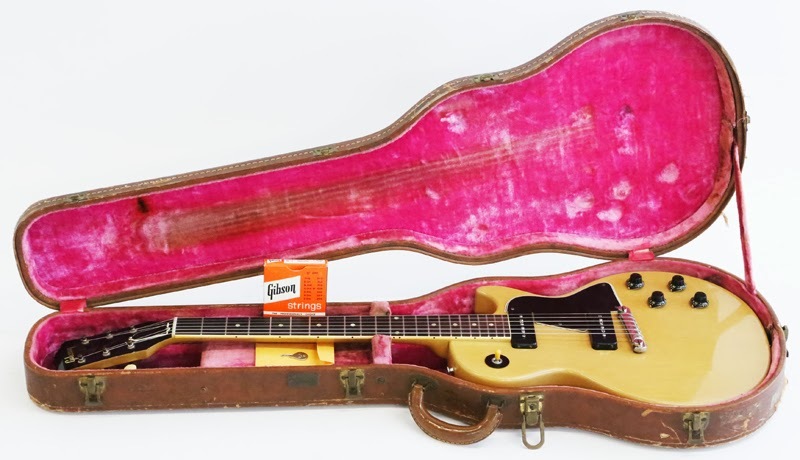 This particular example, serial number 614935, is in very excellent 100% all original condition and includes; the original Lifton brown 5-latch hardshell case with the original Excelsior case key and a box of vintage Gibson electric guitar strings. This incredibly clean no issues example is structurally perfect with no breaks, no cracks, no repairs, and no modifications whatsoever. A similar example was just offered on eBay (auction #290979560137), and was bid up to $14,000 (including shipping) and did not meet reserve, so I decided to offer this example with No Reserve and FREE Worldwide shipping! The single-cutaway Gibson Les Paul Special in TV yellow finish is, without a doubt, one of the most iconic electric guitars ever made. This particular specimen falls just a hair short of being considered a 10/10 mint condition piece, and only really exhibits the slightest evidence of case wear. There is no visible playing wear, arm wear, neck wear, etc., and it displays surprisingly low hours. It's definitely not perfect, but it's the next best thing. This '56 Gibson TV Yellow Les Paul Special features; a single-cutaway slab mahogany body with a TV Yellow finish, 2 soap-bar P-90 pickups, light-weight stop bar/roll over tailpiece, a bound Brazilian rosewood fingerboard with dot inlays, an inlayed pearl “Gibson” logo, single-line Kluson tuning machines with replacement buttons, original top hat control knobs, a 5-ply (b/w/b/w/b) pickguard, nickel plated parts, and an original Lifton brown hardshell 5-latch case with pink interior, like that which would originally be included with a 'Burst. With only the slightest evidence of playing wear, this guitar looks more like a VOS reissue than a vintage original. This guitar would receive a conservative condition rating of 8.9+/10 on a bad day, as the majority of the significant condition flaws are random superficial wear into the clear coat only, none of which have dented through the finish revealing the mahogany beneath. There are several very small dings around the perimeter of the body, and some random wear on the edge of the neck. The guitar is nearly pristine, and it is more impressive in person than in photos. Incredibly, the guitar has not faded in the slightest, and the finish is just as vibrant and sheen as it was when it was made. The finish is the same shade underneath the pickguard as it is on the face of the top. There is only the slightest bit of weather-checking on the guitar, and what little there is, is almost invisible to the naked eye. Perhaps even more incredible is the fantastic player’s qualities the guitar exhibits. While some suggest that “the good ones got played, while the bad ones did not,” this sloppy logic certainly does not apply to this guitar. It feels U-N-B-E-L-I-V-A-B-L-E, and the neck profile is so perfect it really is quite amazing. Both pickups sound exceptional: with clear, sweet, resonant highs, and round, rich, transparent lows and mids, this guitar has the perfected balance of a Bosendorfer Imperial Grand piano. The guitar weighs 7 lbs. and 7 oz. (which is a whole pound lighter than most) and feels absolutely incredible. The original frets display very minimal fret wear, and that which there is, is contained to only the first fret. The frets retain plenty of life, and nicely complement the neck size and shape. The all-around package will make you forget about your other guitars, and focus on bonding with one of the best ever made. The stoptail/wrap-around studs haven’t tilted even a degree, and are perfectly vertical and structurally intact. The original tuning machines have exact spec. reproductions. It was only several short years ago that this guitar was commonly being sold for over $25,000.00, and in my honest opinion, I feel like that value should hold strong today. However, while prices have changed, I feel like the innate value of this guitar has not. It is a ’56 vintage Les Paul TV Special in exceptionally clean all original condition, and both collectors and players alike would agree that this example represents the best of it’s class."